Even though this was my first trip to Maui and therefore had nothing else to compare to, I feel like I can still say with certainty that the Montage Kapalua Bay is the best hotel on the entire island. In fact, it may be the best hotel in all of Hawaii. Not convinced? Let me explain why. With hotel reviews, normally I’ll dive right in with pictures of the facilities, the room, and the food. But what makes this hotel so great is the one thing you can’t show in pictures, the service. As I sit here typing this a month after our stay, I’m still glowing from the incredibly friendly service that we received throughout our stay. In fact, I’d go as far as to say that the Montage offered Aman-caliber service, but in a much more casual style. And that really resonated with us, as we’ve found that type of service, particularly in Asia, to be a bit too doting. One of the most important factors leading to such high-quality service was the continuity of the staff. For the most part, the same group of people were working at the hotel during our 4-night stay. That meant that after day 1 and initial introductions, we were greeted by name the rest of the time, as opposed to being treated simply like a room number. The personalized service even went as far as remembering our preferences with small things like having water with or without ice, to asking us how our activities were after mentioning them earlier in the day. Housekeeping: one of the hallmarks of a good housekeeping staff is to perform their job like ninjas, being rarely seen but also highly effective. They did their job extremely well as our room was freshened up twice a day and always when we were out. Enough about the amazing service, let’s cover the equally amazing hotel facilities. The Montage opened in Summer 2014 and at less than a year old, still looks virtually new. The property has a total of 50 guest rooms, along with 54 residences. The residences may or not be occupied at any given time, so from that perspective the hotel is still small enough to maintain a boutique feel, which means a lot of personal attention and privacy. The drive to Kapalua takes about an hour from the airport, and after driving along the golf course, you’ll turn into the hotel’s driveway. There is a long walkway along a koi pond which leads to the open-air lobby overlooking the beautiful Pacific Ocean. And just in case you’re having trouble seeing it, there’s a telescope handy. The hotel has 5 main residential buildings that form a horseshoe around the focal part of the hotel, the pool. Next door to the hotel is the hotel’s spa which is housed in a standalone building. Hotel guests have full access to the spa, which has its own co-ed swimming pool and hot tub, along with separate steam room, sauna, and hot tub facilities for men and women. Our Virtuoso booking included a spa credit, so we stopped by one afternoon for a relaxing couples massage. The spa also housed a huge gym which contained all of the latest state-of-the-art equipment. And lastly, the hotel had a full child care center with babysitting service. The center looked empty every time we walked by with a lone staff member in there twiddling her thumbs, but I’d imagine that this is a great feature for those with little ones. Perhaps the coolest part of the way the hotel is structured is that you get your own personal elevator entrance. That’s right, no long walk to your room down a hallway filled with screaming people. You simply push the button to your room, and the elevator opens right to it. We were assigned to room #4503 on the 5th floor out of 7. Because of the lack of hallways and the new construction, the sound insulation is amazing. Once you enter your room, you can literally shut out all the noise from the outside world. Even though we had booked a 1BR room, our room was actually a 3BR room with the other 2 bedrooms locked up. That essentially means that whether you book a 1BR, 2BR, or 3BR room, the shared space will be the same. So for just the two of us, there was way more space that we needed. Inside the room, there was a huge state-of-the-art kitchen and the cupboards were filled with every single kitchen gadget you could ever need. Waiting for us were some chocolate covered strawberries. The dining room had a 6-seat dining table. Given how new the hotel is, the furniture was still in great shape and was very comfortable. The bedroom featured an incredibly comfortable king bed and impressive blackout curtains that could turn the room into a cave even in the middle of a sunny Hawaiian summer day. The bathroom was huge and featured a rain shower and separate soaking tub. There was another half bathroom near the room entrance, along with washer and dyer. There were sliding doors from 2 of the bedrooms and the living room leading out onto the patio, which featured 6 recliners, a day bed, and a 4-seat dining table set. Our partial ocean view room overlooked the pool, and had great views out into the ocean and the neighboring island. Another cool feature was that both the bedroom and living room TV’s were each equipped with DVR’s. While I tend not to watch much TV when on vacation, my Sunday TV ritual is an exception and it was great to be able to record all my shows and watch them at my leisure. At many beach-front resorts, the pool can almost feel like an afterthought, since after all you’re just steps away from the ocean. But as crazy as this might sound, the Montage has somehow managed to design a pool that outshines the ocean. First of all, let’s talk about how many pools there are on the property. By my count there were 3 – at the Spa, at the adults-only Beach Club, as well as the main pool in the middle of the resort. The main pool was really something special, it’s far and away the nicest pool I’ve ever seen in my life. The pool is so big that it feels like it takes up an entire city block. The upper part is the “Serenity Pool” which as the name suggests is a quiet area where cell phones and children are banned. Other hotels may have larger pools, in particular those in Vegas for example, but they are just so crowded and you are more than likely to find a beer can floating around. The Montage’s pool was designed in a way that no matter how many people were around, you could still feel like you’re the only one in the water. They’ve achieved this by creating nooks and crannies all over the place where can keep out of sight from others. Also, the number of pool chairs to guest ratio was great because we never had to fight for a spot at the pool, which can often be the case at other hotels. Oh, and I can’t forget to mention the waterfalls. By my count there were 4 of them, including the big one below. I mean, who doesn’t like swimming through waterfalls? But I think the pool was so amazing that the pictures above just can’t possibly do it justice. So I made the video below to give a full tour. From what I could tell, most guests had lunch by the pool and that’s what we did one afternoon. We ordered a cool and refreshing mahi mahi poke dish, along with a pulled pork pizza. In addition, snacks were brought out throughout the day. Near the pools there were also a handful of games available for guests, including a putting green, bean bag toss, and Connect 4. 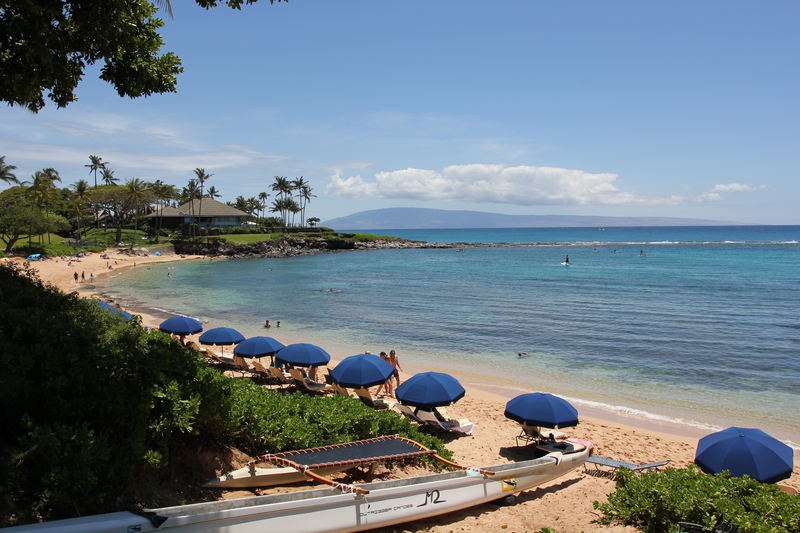 Just a 5-minute walk down from the hotel was Kapalua beach. Even though its a public beach, on the far end nearest the hotel, there was a section reserved for Montage hotel guests. There was a beach hut that provided equipment and also beach chair service. We identified ourselves as hotel guests to the staff, and were told that the beach chairs and snorkeling equipment were complimentary. We loved snorkeling here, in particular because there were a couple sea turtles that made daily trips to feast on the algae here and were more than happy to hang out with us while eating. In addition to the pool restaurant and room service, the hotel’s main restaurant Cane & Canoe was open for breakfast and dinner. Our room rate included breakfast and that’s pretty much the only meal that we had at the hotel. The food is perhaps the only weak spot in the Montage’s resume. For the most part it was just good, but certainly not special or memorable. The breakfast menu featured a range of starters and entrees, and each morning started with a squash muffin amouse bouche. Our Virtuoso rate included a $60 breakfast credit which was more than enough for the 2 of us. On the first day I went with the eggs benedict. And my wife tried the egg white fritatta. One of my favorites was the acai bowl which was delicious and refreshing. And on the final day, not having to worry about wearing a swim suit later on, I indulged in the purple potato pancakes. On 3 out of the 4 days we went down to the restaurant for breakfast, and the other day we tried room service which had a smaller menu with more limited options. The loco moco was somewhat forgettable, with overcooked patties and congealed gravy. Overall, our stay at the Montage Kapalua Bay was amazing, highlighted by the best service that we have ever received at a North American hotel. If we return to Maui this will definitely be our hotel of choice. Our stay was also a great introduction to the Montage brand, and has us already planning out future stays at some of their other properties in Southern California, Colorado, South Carolina, and (soon to be) Los Cabos. I’m fresh out of $1,000 (a night)… and that’s for a Garden view room. would you mind sharing how much the room cost? We took advantage of a 4th night free offer, along with free upgrade at time of booking. So while the retail price of our room was $875/night, we got it for $590/night + taxes. Your website name is funny, since this hotel apparently doesn’t take points. Beautiful photos, much appreciated, but I don’t think you’re too hungry for points if you can afford such digs – or now that I think of it, maybe they comped your stay for the review. That’s awesome either way. Congrats. It’s a fair point, but I can confirm that I am indeed hungry for both points and food. Almost all of my points-earning efforts are focused on airline miles, so I typically pay out-of-pocket for hotels like we did here. Unfortunately, I’m too much of a nobody for the hotel to offer a comped stay. Thanks for clarifying Terence. It’s too bad (for us of course) that some hotel chains don’t have a points program/credit card promos, etc. But it is to their advantage as well, keep out the churner riff raff (me included). Your review goes to show how incredible some hotels are that are rarely reviewed in the miles and points blogosphere. I appreciate all your hard work, pictures and write up. Keep it up! We’ll be in that neck of the woods in a month or so, staying at the Hyatt on points. Free is free but I would certainly pay for a stay at the Montage based on your report. Certainly looks like a wonderful place, the Montage Kapalua. But getting that close to a sea turtle and cornering it is a violation of state and federal law. This shot would be okay if and only if the animal initiated the approach and got close to you voluntarily, and if it was not in any way obstructed in its ability to get away, like waving hands or a camera at it, while also immediately moving slowly away yourself. @Daph: What a PITA you are!!!! The review is about the hotel and not the turtle. Do you work for the Greenpeace? Do you know that turtle by name? Thank you for sharing. I neither know the turtle by name, nor work for Greenpeace. Human contact with and proximity to turtles (and other forms of marine life protected by Hawaii Statute) is an ongoing and serious challenge to our marine environment. One of the stated attractions of Kapalua beach is the turtle; however, observation of the sea turtle should be from a distance, as recommended by the DLNR. Watch out y’all. The internet police is out in full force. Thanks for the trip report. Earning points is a moot point (pun intended) when staying here and can be very affordable with promotions. Just came from a family trip to Hawaii. 5 nights in the Big Island and 5 in Maui. We thought about staying at the Montage. There was a good deal through Amex FHR where you booked 4 nights and got the 5th free but it was still around $800/night. However, after doing a lot of research about the hotel we thought the hotel would probably be a great fit for a couple but was not the best choice for our kids. Also, we visited the Kapalua area twice during our trip. While it was sunny and warm in Wailea both days we got rain and a cold wind in Kapalua. We stayed at the Fairmont Kea Lani. Of course it was not the boutique feeling you got at the Montage but for our kids it was the perfect choice. My husband and I will be traveling in August, and are going back and forth between here and the Fairmont, this review helped tremendously. Thank you!